As long-time readers will know, Rob The Bull Bohane, Ciarán Byrne and Finbarr Hedderman are all Sandycove Island Swim Club members, English Channel Soloists and very good friends. Ciarán and Rob are two members of our 2010 Magnificent Seven Channel training squad. All three are very experienced open and cold water swimmers, and are three of the people I most like and trust swimming with (when Finbarr is not trying to drown me). Recently all three took part in another ice-mile, the week prior to the Lough Dan Ice Mile and I’m delighted to have Ciarán’s account of the swim. (I was to be part of the attempt but for various reasons decided against it). I’ll stress that these three swimmers have a wealth of cold water experience, and the helpers and assistants as you can see below also have great experience. The location was in the Kerry Mountains in the south-west of Ireland. (Lough is the Irish for lake, by the way and is pronounced “lock”). Ice Mile Lough Iochtar, Kerry, 10th Feb 2013. Ram Barkai from South Africa set up the International Ice Swimming Association in 2009. To become a member you must swim a mile (1609.3m) in water of 5.0°C or under. 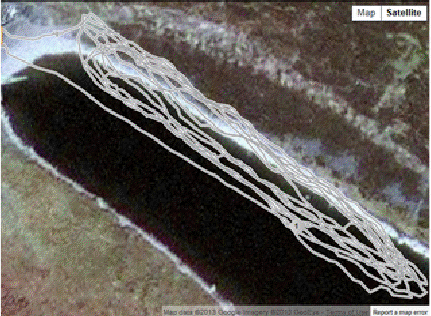 At time of writing there have been 51 recorded ice swims by less than 50 swimmers. Sandycove Island Swim club decided to join the fun. 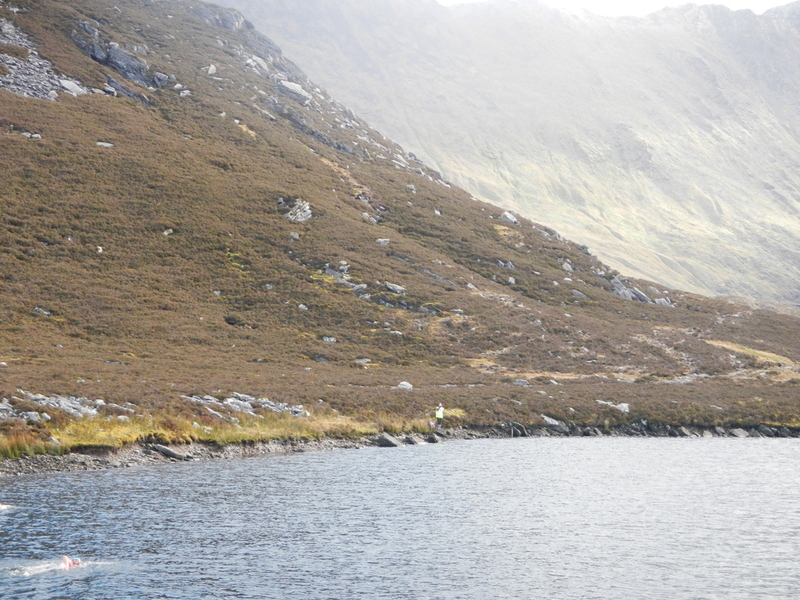 We scouted the sea and lakes in Cork and Kerry. Through Rob’s Kerry connections 3 lakes about half way up Carrauntoohil (Ireland’s highest mountain at just over 1000 metres- Ed.) were identified which were accessible by 4×4 vehicles. The peak of Carrauntoohill on the bottom right, small Lough Iochtar on the upper left, Coomloughra Lough in the middle and Lough Eagher on the right respectively. Rob, Finbarr and I agreed to try one of these lakes on Sun 10th Feb.
Leaving Cork on the morning of the 10th the weather was great. Clear blue skies ahead. We went first to Lough Acoose to meet the great support team from the Sandycove Island Swim Club. Lisa (English Channel Two-way swimmer), Eddie (Triple Crown Swimmer), Carol (Lake Zurich silver medallist and Irish Masters Squad member) and Pascal (Finbarr’s dad). We met the Kerry Mountain Rescue team of John Dowd, John Cronin and Angela O’Connor near the water treatment plant. 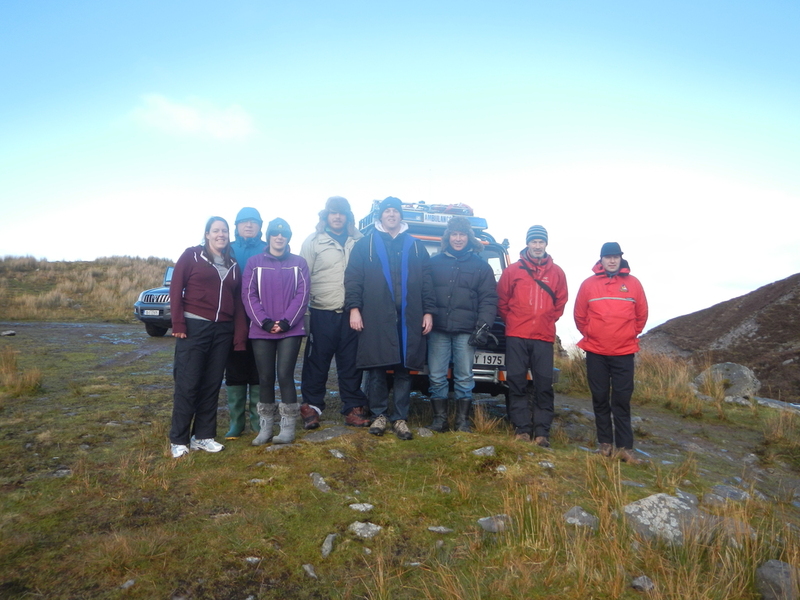 We headed up in two 4-wheel drive cars including the fully equipped Kerry Mountain Rescue Ambulance. 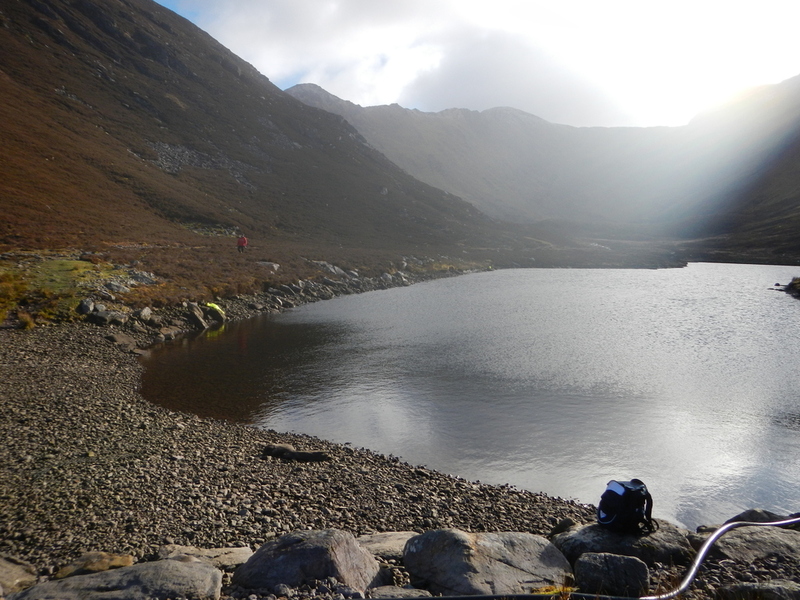 When we reached the first of three lakes, Lough Iochtar, we stopped for a look. 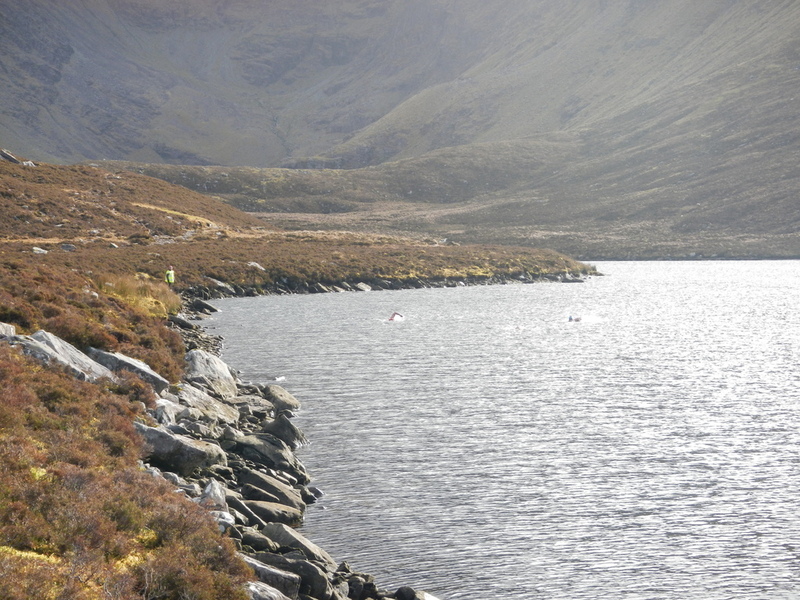 Lough Iochtar is a small lake approx 300m long and approx 75 metres at its widest point. It’s at 440m elevation. There was a small stone beach near the road. It looked ideal. during the swim were 4.5, 4.9 and 4.8C. Average 4.7C. The air temp was 3°C. There was a cold wind and the wind chill was -3C. The altitude didn’t adversely impact our breathing. That was something that had concerned us about the location. We unloaded the jeeps and set to measuring the swim distance. We went for old school. Rob had brought a measured 50m length of line. Rob and John used it to measure out a 100M course. We marked the ends with fluorescent jackets. The plan was to complete eight loops of the 200M course, which was marked 10 metres from the start, the ends of the course to be marshalled by observers. The wind was picking up so we got a group photo and then got changed. Eddie and Carol put on their wetsuits in case they needed to help any of us out of the water. Lisa helped set up the GPS tracker on my goggles. We were going for high and low tech on this swim. 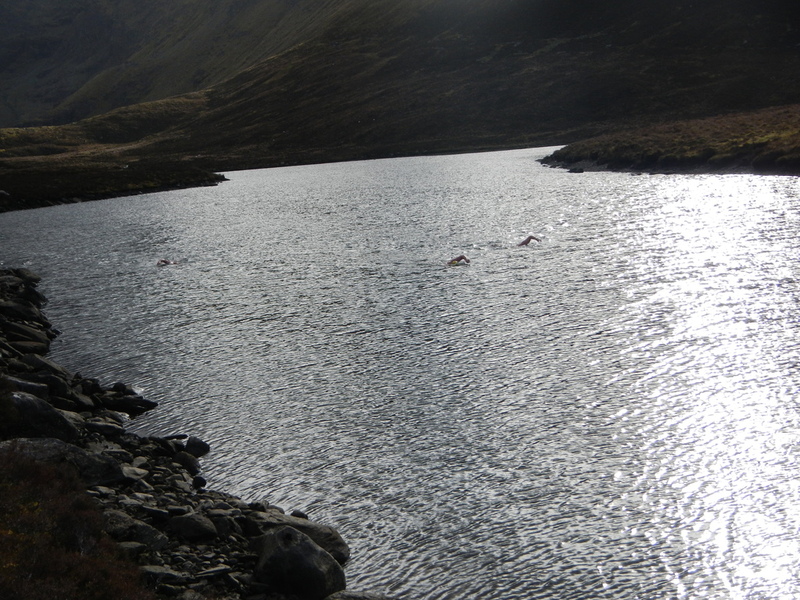 We each had an observer to count strokes and watch for signs of hypothermia. Eddie for Rob, Carol for Fin and Lisa for me. We had agreed that if there was a sharp drop in stroke rate that we’d be pulled. We pre-arranged a signalling system to warn us when we had to come out. The back-up was that in the event of no response Eddie or Carol would swim in to get us out. We got changed on the beach. One standard silicon cap, ear plugs, one pair of standard togs and goggles. A little Vaseline under the armpits for chafing. Pascal gave words of encouragement. We shook hands and set off. The large stones were sore on the feet. 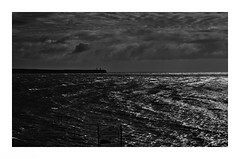 The water biting at the feet. The first couple of metres were shallow. There was then a sharp drop off so we slid into the water and into our stroke. The experience in the first 100M was not unlike our experience in Tooting Bec Lido at the UK Cold Water Swimming Championships. The hands soon got icy cold. The arms felt tight at the stretch. The first 200M passed quickly. I had completed the Endurance swim (450M) at the CWSC so I knew I could go that far. However I was concerned that I was so cold so early. The next 200M were tough. My hands were as cold as they were in the endurance swim and I had another 1200M plus to go! Nothing for it but to keep swimming. Concentrate on the stroke. challenge. Once you passed the fluorescent vest you had to turn in deep water. I had a near collision with Rob after the 600M turn. He had turned ahead of me and I was breathing to the right looking for the mark. 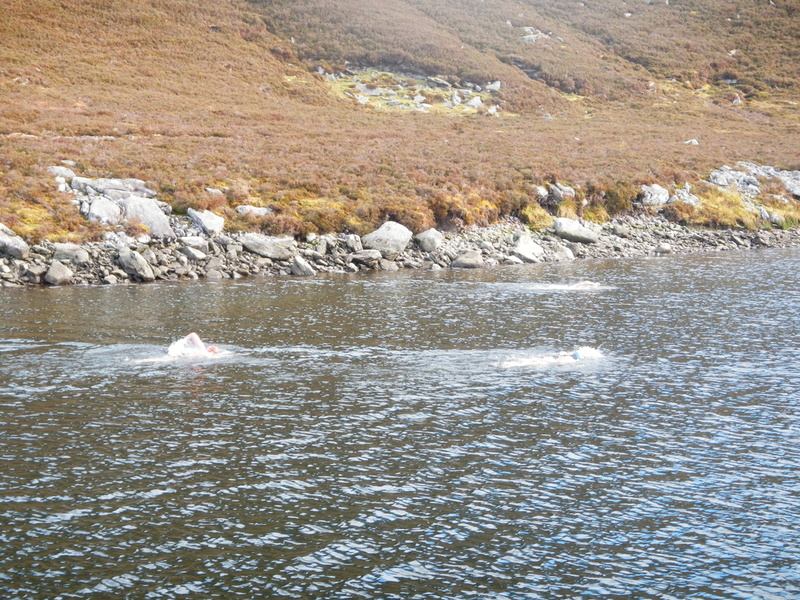 No damage done and quickly back into the swim. After 600M I started to settle into the swim. I was closing in on the half way mark. I wasn’t getting any colder. My stroke was holding up. The sun had come out and was very welcome. 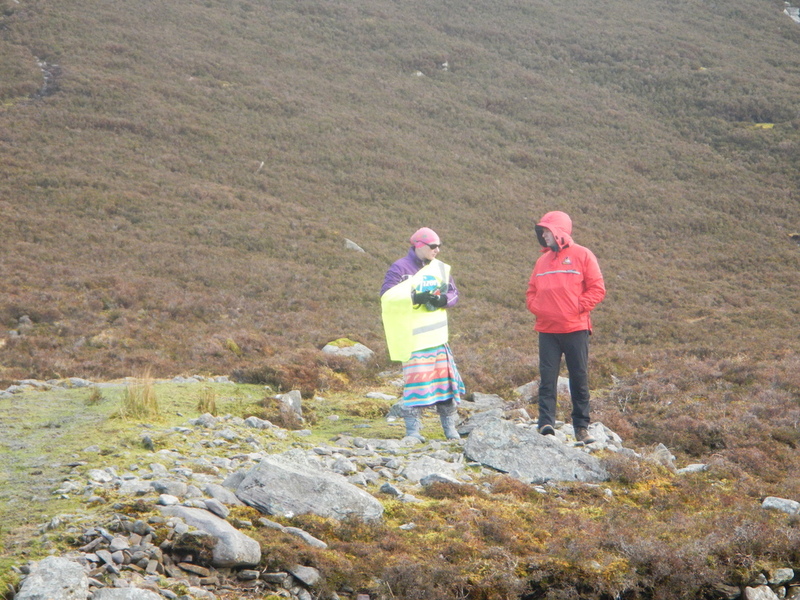 After 1400M my feet got very cold and borderline cramping – I knew if I kicked too hard I would cramp. We got the whistle for the final loop. Head down and go for it. I came into the finish. Fin had finished first, well ahead. 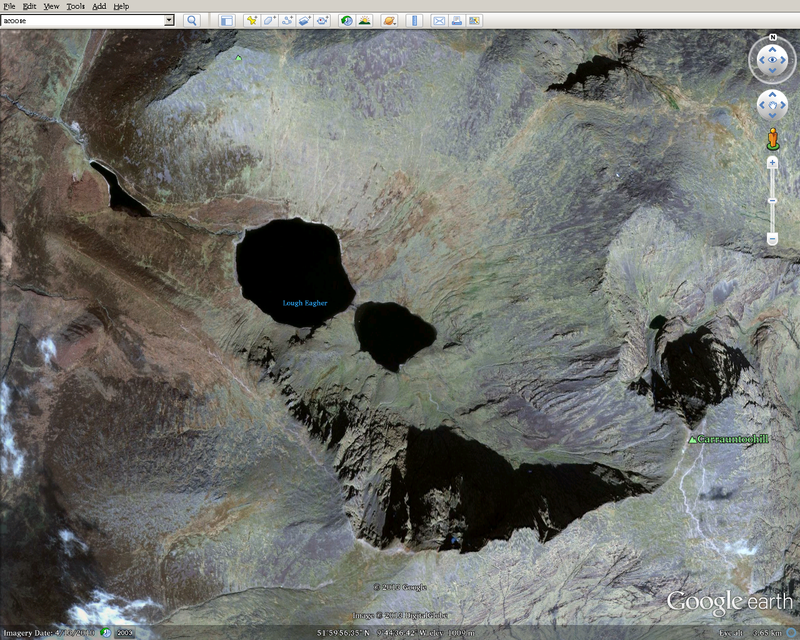 The Lough Iochtar Monster. He came into his own in the second half of the swim and left us behind. Rob was in next and I came in not too far behind. I tried to get in as close as possible to avoid wading in over the rocks. They were going to be painful. I was very unsteady on my feet and Pascal helped me up and gave me my crocks. Lisa was waiting with my towel. Carol came over to help Lisa get my jacket on. Then straight into a warm Jeep to get dressed. Lisa was great, organising my clothes, getting tea and making sure I was ok. Once dressed I got into the front into the heated seat – pure luxury. We were all a bit unsteady on our feet when we go out. Fin didn’t need the car to get changed. He seemed unfazed by the swim and probably could have done a double. Rob got changed outside but soon joined me in the jeep and recovered quickly as well. After about 20 mins we were all in good shape. The wind had picked up and it was starting to rain. We certainly got the best of the weather for our swim. We decided it was time to get our gear together and head back down to Killarney. I’d like to thank the great support we got from our Sandycove friends, Lisa, Carol, Eddie and Pascal, Angela from Caherciveen and the two Johns from the Kerry Mountain Rescue. These events are not possible without volunteers who freely give their time to help others reach their goals. We believe this is the highest altitude ice mile in Europe.